Background/Info: !Distain fans will be intrigued to discover this debut solo-work of the band’s front man Alex Braun. “Eiskalt” is a kind of conceptual record featuring 4 cover versions. Content: The covers are taking off by Zara-Thustra’s “Eiskalt” to move on with Black’s “Wonderful Life”, Lou Reed’s “Perfect Day” and Mary Roos’ “Pinocchio”. The original versions are pretty different, covering different genres and periods, but adapted into pure electro-pop with backing vocals by Alissa Braun (who’s Alex’ daughter). + + + : Cover versions are always a bit tricky, even a kind of challenge, but it also is a way for an artist to interpret songs they like plus bringing songs to life and catching the attention of music lovers who maybe didn’t know the original version. 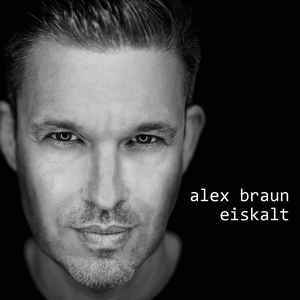 Alex Braun did the job with grace and especially Lou Reed’s “Perfect Day” is a real honest version. I personally prefer the intimate version of “Wonderful Life”. – – – : No doubt about it, this EP is meant to please Alex Braun and his truest fans instead of becoming a record that will enter into history. Conclusion: I’m really wondering if Alex Braun will move on with solo-recordings, but in the meantime you for sure will discover the new !Distain full length album. Best songs: “Wonderful Life”, “Perfect Day”.